At Alpharetta Eye Clinic and Windward Eye Care, our doctors firmly believe that with better vision comes a better life. What better way to ensure maintaining your vision than scheduling a comprehensive eye exam? You can trust the doctors at Atlanta Eye Care. They understand that each set of eyes is unique. They treat patients as individuals with their own special needs. You’ll receive personalized attention in an efficient and professional manner when you visit our vision centers. The American Optometric Association recommends scheduling an eye exam at least every 2 years as a great way to insure eye health. Older patients should schedule an exam every year. 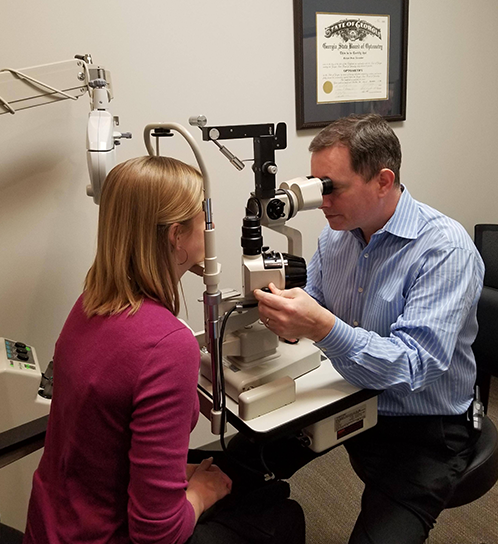 Pupil dilation – Once dilated, each eye is examined using a special magnifying lens that provides a clear view of important tissues at the back of the eye, including the retina, the macula, and the optic nerve. Glaucoma, cataracts, and macular degeneration are just a few of the common eye diseases which affect older patients. People with diabetes, high blood pressure, rheumatoid arthritis and, those taking certain medication are especially at risk for eye diseases and vision loss. Patients with a family history of these conditions are at risk as well. Today, our optometrists can treat a wide range of eye problems to save your vision. Annual exams can detect eye and systemic diseases in the early stages when it is easier to prevent vision loss. At the first appointment, we focus on learning everything we can about you. It’s important we record details of current medications, medical history, and eyeglass and contact lens prescriptions. The exam includes an extensive diagnostic eye evaluation and a discussion of our findings and response to any questions and concerns. Atlanta Eye Care wants our patients to understand the current state of their overall eye health. We believe we are only successful when patients completely satisfied. Keep calm and get your eyes checked. Annual exams are an important tool in protecting eyesight and overall health for everyone, regardless of age. It’s simply more crucial for older adults. Remember, many vision problems can begin at an early age too, so it’s important for children to receive proper eye care from the time they are infants. Contact us for an appointment. Adult Eye Exam: Our full range of vision services includes examination, contact lens fitting, and co-management of certain surgical procedures. We have two offices conveniently located in Alpharetta, GA. These offices serve North Fulton County patients including those from Roswell, Milton, Johns Creek, Duluth, and Suwanee. Don’t take chances with your vision. Schedule an eye exam today at either our Alpharetta Eye Clinic or Windward Eye Care location. We believe success starts with good vision. In between examinations, contact us if you notice a change in your vision. Detecting and treating problems early can help maintain good vision for the rest of your life.